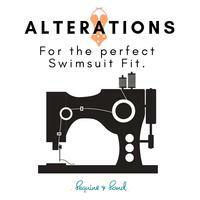 Swimsuit Alterations are here at Sequins and Sand! It's the latest service on offer to help you get that well fitting swimsuit to have you feeling fabulous. We know after years of fitting swimsuits, that not everyone can just buy swimmers 'off the rack' and have it fit perfectly all over. And we know how frustrating it is when it's all too familiar, season after season. Alterations are needed when going down or up a size or two just isn't an option especially if you want to wear a one piece and you have say a 20 top and a 16 bottom. It gets back to our individual shapes. Each need is very personal but not as uncommon as you might think! Flat bum? Narrow hips? You'll need the legs taken in. Short torso? You'll need the hem taken up or length taken out. Narrow shoulders? Straps may need shortening. That’s why we now offer an Alterations service here at Sequins and Sand so that you can get your perfect fit each and every time. Teaming up with Brisbane lycra specialists who know how to sew and work with it so very well, we've being offering this service in our studio for some time and now, online!